Steel horseshoes might increase mechanical loading on foot, evidence suggests. Images of the experimental and virtual set-up. “A” shows the set-up of the horse walking on the custom-made platform retrofitted with a forceplate and surrounded by the bi-planar fluoroscopy system. “B” shows the virtual setup of the horse’s right forefoot based on the experimental alignment of the X-ray sources and the intensifiers. Images in black the frames (right and left) illustrate the projections of the distal foot from the two X-ray cameras. Some of the mechanical forces arising from the use of metal horseshoes have been revealed in a groundbreaking study that successfully assessed the effects of movement in a three-pronged approach. Findings of the preliminary case study, which delved into the effects of shoe-wearing on the mechanics of a horse’s front feet, have been reported in the open-access journal PeerJ. Researchers Olga Panagiotopoulou, Jeffery Rankin, Stephen Gatesy and John Hutchinson used a single Thoroughbred for the study, assessing it first while unshod and then with stainless steel front shoes. “Our preliminary study illustrates that the stainless steel shoe may influence the dynamics and mechanics of a Thoroughbred horse’s forefoot during slow walking, although our results are inconclusive in some important aspects,” they reported. The expansion of their research, they said, had the potential to bolster confidence in equine biomechanics to better understand the form, function and pathological relationships of the anatomical tissues of the equine foot. The researchers said musculoskeletal injuries were a common cause of economic loss within the multibillion-dollar racing industry and were a major welfare concern. Musculoskeletal injuries in horses arose from multiple causes. Pre-existing problems, increased speeds, and track surfaces had all been recognised as contributing factors. Horses have evolved to maintain only their third digit, which ends in a rigid hoof capsule. It is functionally adapted to fast speeds. The hoof and nearby joints receive most of the impact loads when the foot hits the ground. At fast speeds these loads can exceed 2.5 times the horse’s body weight. Under load-bearing conditions, the distal and coronary borders of the hooves expand, the dorsal hoof wall rotates about the third digit and the heel expands 2 to 4 millimetres. “Horse hooves have the ability to naturally deform during locomotion and dissipate locomotor stresses, yet farriery approaches are utilised to increase performance and protect hooves from wear,” they said. Different horseshoe materials had varying effects on horses’ feet due to their wide range of weight, toe angle, frictional and damping properties, as well as their interaction with foot trimming, the study team said. The study team noted previous studies in horses showing that elevating the hoof with a shoe increased the pressure within the distal interphalangeal joint [at the coffin bone], potentially accounting for an increase of bone stresses that could enhance the development of degenerative joint diseases. “Despite the likelihood that shoes impact equine digit function, current knowledge of the relationships between foot function, farriery approaches and musculoskeletal injury is limited,” they noted. This was partly due to the lack of an established experimental protocol for studying foot dynamics and mechanics in live horses. “Previous studies have assessed the effect of different shoe designs on locomotor performance,” they observed. However, no biomechanical study had measured the effect of horseshoes on the stresses of the foot skeleton in the living horse. The researchers used a novel method to measures these effects, combining three-dimensional data from radiography on two planes, inverse dynamics methods and what is known as finite element analysis. For the study, a 540kg adult male horse was used. He had previously been trained for and participated in locomotor studies. Fifteen minutes of training were provided for the horse to adapt to the experimental setup. 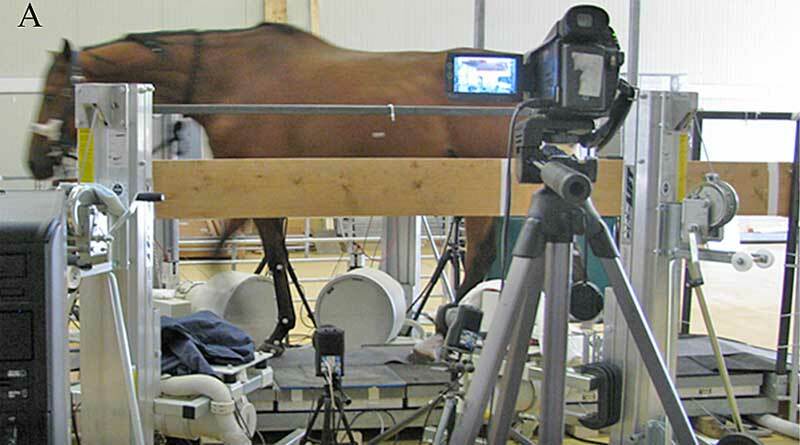 The horse was led across a custom-designed platform rather than a treadmill for the research. While unshod, he was guided 344 times across the experimental platform over a period of two weeks. Each trial lasted two to four seconds, during which high definition video and x-ray imaging from two adapted high-speed digital cameras were collected. The horse’s front feet were then mildly trimmed and fitted with stainless steel shoes with toe clips (5 inches wide) and 6 nails. The identical procedure was then followed to guide the shod horse over the platform 65 times on a subsequent day. There were fewer passes with shoes due to incomplete data being gathered on a good number of the unshod passes. “Our preliminary results suggest that the stainless steel shoe shifts craniocaudal, mediolateral and vertical ground reaction forces at mid-stance,” the study team reported. They observed a similar pattern of flexion-extension in the pastern and coffin joints between the unshod and shod conditions, with slight variation in rotation angles throughout the stance phase. They also determined that the coffin joint extended more than the pastern joint after midstance and until the end of the stance in both the shod and unshod conditions. Further analysis, centered solely on the bones, revealed evidence of stresses on the forefoot phalanges in the shod condition at mid-stance. This, they said, was consistent with the tentative conclusion that a steel shoe might increase mechanical loading. The study team anticipate that its methods will pave the way for new directions in research in the field. The researchers are variously affiliated with the Structure & Motion Laboratory at Britain’s Royal Veterinary College; the Moving Morphology & Functional Mechanics Laboratory at the University of Queensland in Australia, and the Department of Ecology and Evolutionary Biology at Brown University, Providence, Rhode Island, in the United States. The preliminary case study, published under a Creative Commons License, can be read here.